Rye is the common name for the cereal grass Secale cereale, grown extensively as a grain crop. As a member of the grass family Poaceae and the tribe Triticeae, it is closely related to wheat and barley. The term rye also refers to the edible grain of these plants. The term rye also can be used for any of the members of the Secale genus, but is particularly used for Secale cereale, which will be the focus of this article. Rye serves a variety of purposes. It is used for making flour, rye bread, rye beer, some whiskies, and some vodkas, as well as serving as a livestock feed. It can also be eaten whole, either as boiled rye berries, or by being rolled, similar to rolled oats. Even the tough rye straw is used for such purposes as roof thatching and animal bedding. Rye is a cereal and should not be confused with Ryegrass which is used for lawns, pasture, and hay for livestock. Rye is a member of the grass family, Poaceae, one of the largest and most important plant families, which also includes wheat, rice, barley, and sugar cane. There are about 600 genera and perhaps ten thousand species of grasses. Grasses, like orchids and palms, are monocotyledons. Monocotyledons are one of two major groups of flowering plants (angiosperms), the other being dicotyledons. Monocotyledons have only one cotyledon, or embryo leaf, rather than the two found in dicotyledons. The largest family in the monocotyledon group (and in the flowering plants) is the orchids. However, the most economically important family in this group is the grasses, which include the true grains (rice, wheat, maize, barley, rye, etc.). Unlike dicotyledons, the true grasses are specialized for wind pollination and produce smaller flowers. Rye is a member of the wheat tribe (Triticeae) within the Pooideae subfamily of grasses. Major crop genera are found in this tribe including wheat and barley, and rye. Rye is known as a hardy plant that can be grown where conditions (soil, climate) may be unfavorable for other cereal crops. It is highly tolerant of soil acidity and is more tolerant of dry and cool conditions than wheat, though not as tolerant of cold as barley. The flame moth, rustic shoulder-knot and turnip moth are among the species of Lepidoptera whose larvae feed on rye. 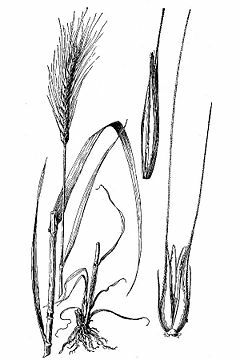 In addition to Secale cereale (cereal rye), other species in the Secale genus include Secale cornutum (ergot of spurred rye), Secale strictum, Secale sylvestre (Tibetan rye), and Secale vavilovi (Armenian wild rye). Secale cornutum is used as a herbal medicine at low doses, but is deadly poisonous as food (Eadie 2004). The early history of rye is unclear. The wild ancestor of rye has not been identified with certainty, but is one of a number of species that grow wild in central and eastern Turkey and adjacent areas. Domesticated rye occurs in small quantities at a number of Neolithic sites in Turkey, such as PPNB Can Hasan III, but is otherwise virtually absent from the archaeological record until the Bronze Age of central Europe, around 1800-1500 B.C.E. (Zohary and Hopf 2000). It is possible that rye traveled west from Turkey as a minor admixture in wheat and was only later cultivated in its own right. Although archaeological evidence of this grain have been found in Roman contexts along the Rhine Danube and in the British Isles, Pliny the Elder is dismissive of rye, writing that it "is a very poor food and only serves to avert starvation" and wheat is mixed into it "to mitigate its bitter taste, and even then is most unpleasant to the stomach" (Natural History 18.40). Since the Middle Ages, rye has been widely cultivated in Central and Eastern Europe and is the main bread cereal in most areas east of the French-German border and north of Hungary. Claims of much earlier cultivation of rye,at the Epipalaeolithic site of Tell Abu Hureyra in the Euphrates valley of northern Syria remain controversial. Critics point to inconsistencies in the radiocarbon dates, and identifications based solely on grain, rather than on chaff. Rye is grown primarily in Eastern, Central and Northern Europe. Main rye belt stretches from northern Germany through Poland, Ukraine, Belarus, Lithuania, and Latvia into central and northern Russia. Rye is also grown in North America (Canada and the USA), in South America (Argentina), in Turkey, in Kazakstan, and in northern China. Production levels of rye are falling in most of the producing nations due to falling demand. For instance, production of rye in Russia fell from 13.9 million metric tons (m t) in 1992 to just 3.4 m t in 2005. Corresponding figures for other countries are as follows: Poland - 5.9 m t in 1992 and 3.4 m t in 2005; Germany - 3.3 m t and 2.8 m t; Belarus - 3.1 m t and 1.2 m t; China - 1.7 m t and 0.6 m t; Kazakhstan - 0.6 m t and 0.02 m t.
Most of rye is consumed locally, and is exported only to neighboring counties, but not worldwide. Rye is highly susceptible to the ergot fungus. Consumption of ergot-infected rye by humans and animals results in a serious medical condition known as ergotism. Ergotism can cause both physical and mental harm, including convulsions, miscarriage, necrosis of digits, and hallucinations. Historically, damp northern countries that have depended on rye as a staple crop were subject to periodic epidemics of this condition. A rye field in Russia, as depicted by Ivan Shishkin in 1878. Rye bread, including pumpernickel, is a widely eaten food in Northern and Eastern Europe. Rye is also used to make the familiar crisp bread. Rye flour has a lower gluten content than wheat flour, and contains a higher proportion of soluble fiber. It is high in carbohydrates and low in protein and B vitamins. Some other uses of rye include rye whiskey and use as an alternative medicine in a liquid form, known as rye extract. Often marketed as Oralmat, rye extract is a liquid obtained from rye and similar to that extracted from wheatgrass. Its benefits are said to include a strengthened immune system, increased energy levels, and relief from allergies, but there is no clinical evidence for its efficacy. Rye, alone or overseeded, is planted as a livestock forage or harvested for hay. Rye straw is used to make corn dollies and for roof thatching, animal bedding, and mattresses, among other uses, given its tough nature. In Turkey, rye is often grown as an admixture in wheat crops. It is appreciated for the flavor it brings to bread, as well as its ability to compensate for wheat's reduced yields in hard years. Integrated Taxonomic Information System (ITIS). 2007. Secale L. Taxonomic Serial No. : 42089 ITIS. Retrieved January 2, 2008. Pliny the Elder. 77 C.E. The Natural History. Book XVIII. The Natural History of Grain. Chapter 40. Secale or Asia Edition and translation by J. Bostock and H. T. Riley, 1855. Retrieved January 2, 2008. Zohary, D., and M. Hopf. 2000. Domestication of Plants in the Old World: The Origin and Spread of Cultivated Plants in West Asia, Europe, and the Nile Valley. Oxford: Oxford University Press. ISBN 0198503571. This page was last modified on 2 April 2008, at 15:41.